Classic Chinese restaurant style sweet and sour chicken has gotten a bad rep. But not this baby! Full of aromatic, colorful roasted vegetables and a zesty and easy sauce, this sweet and sour chicken will change your restaurant carryout habits forever! It’s safe to say we all love the classic sweet and sour chicken. Full of sweet and tender chicken and crunchy vegetables the Chinese restaurant classic has become everyone’s favorite take out food. Unfortunately, it is typically breaded, deep fried and tossed in a sauce that is oozing with sugar and ingredients I cannot pronounce. I have been wanting to recreate this classic favorite at home for quite some time, but this past weekend I was re-inspired when I went to brunch for a friend’s “sprinkle”. Side note…do you guys know what a sprinkle is? It’s a baby shower for your second baby. I mean really…this is what our lives have come down to… we do sprinkles as an excuse to get together to brunch and booze…this is what my life has come down to. Anyhow…this past Saturday we all got together for a brunch to celebrate our friend’s preggo belly. And we boozed. And we ate. Al fresco in the gorgeous Chicago sun. I love summers in Chicago. One of the best parts of being vegan right now is the trend that a lot of restaurants are developing towards including more and more plant based items on their menus. 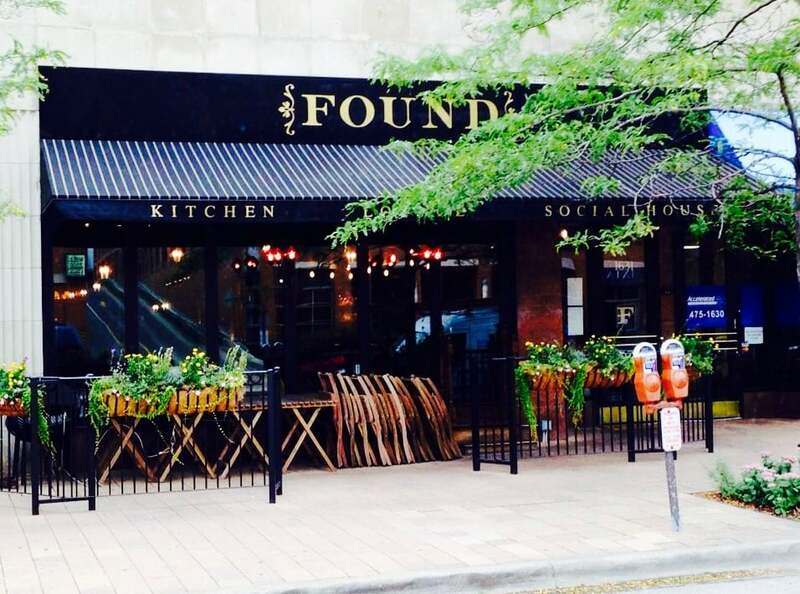 This particular restaurant we dined at in Evanston, was called Found Kitchen and Social House . For a darn good reason. Everything there is “found” locally, this includes the food, the furniture and even the people. They have a really strong mission statement and an incredible menu to match. I had arrived after most of the other girls and they had already ordered several small plates. They had inadvertently ordered several vegan dishes that I ended up getting more orders of because of how delicious they were. They had an amazing swiss chard and kale salad tossed in a green goddess dressing with a flax cracker that I could not get enough of. And their roasted broccoli and cauliflower with harissa was out of this world (that recipe is coming soon.) But the crowning glory of the brunch was their summer vegetable stir-fry with chicken, pineapples and farmers market vegetables. This dish was OFF THE HOOK! I picked out all the vegetables and devoured it in seconds along with the fragrant jasmine rice. There was a cornucopia of vegetables each succulent and crunchy. Multicolored carrots, sweet turnips and pineapple, delicate squash and savory red onions were all roasted to a gorgeous perfection and complimented the tangy sauce perfectly. It was not swimming in the sweet and sour sauce but instead just gently tossed in it. It was insanely delicious and I ordered a second serving immediately after we devoured the first. 30 minutes later I had an incredible sweet and sour chicken loaded with crispy oven roasted vegetables and a tangy sauce. All done without all the fat lent to deep-frying and dredging. Plus I whipped up a super quick and delicious side dish by just tossing broccoli florets with some powdered ginger, salt, pepper and olive oil. Now THAT I can literally eat like popcorn! Flipping amazing! Tell me that isn’t one gorgeous meal?! Pleasing to the eyes and the palate. Enjoy everyone! Full of aromatic, colorful roasted vegetables and a zesty and easy sauce this sweet and sour chicken will change your restaurant carryout habits forever! 3 pounds of chicken breast sliced into 1 inch cubes. 3 cups of cooked rice to your liking Note 1, I prefer jasmine or basmati. Combine, turnips, squash, zucchini, carrots and onions on a sheet pan and toss with olive oil and plenty of salt and pepper. While the veggies are roasting, add coconut oil to a large pan over high heat. Season chicken pieces with salt and pepper, liberally, Add chicken to pan in batches ensuring not to crowd the pan. Brown the chicken evenly on all sides and remove. Lower heat to medium. Ensure there is enough oil on the bottom of the pan. IF there is not, do not add more oil in, simply pour off some of the juice from the chicken that has been set aside. Add red pepper and cook for 3-5 minutes, until soft. Add ginger, garlic and chili flakes. Allow to cook for 2 minutes over low heat, ensuring not to brown. Add pineapple and caramelize the pineapple. Add chicken, soy sauce, sesame oil, pineapple juice, lemon juice and sweet and sour sauce. Bring to a boil. Add roasted vegetables and stirfry everything together so it is nicely coated with the sauce. Serve over rice and sprinkle with scallions. Place broccoli florets on a sheet pan and toss with ginger, salt, pepper and olive oil. Roast for 15 minutes until beautifully browned on all sides. Note 1: I always have rice in my freezer. Then I always have extra to use when I need it. Just stick it in the microwave for 3 minutes and boom your side dish is ready to go. Note 2: This just happened to be the one sauce I really like. I happened to have tasted many of their other products and was really pleased with all of them. But feel free to use any other sauces that you have found work for you. Note 3: Sometimes I have found one side of my oven burns hotter. Usually it's the back of the oven. So I find that I need to rotate my sheet pan to ensure even browning and cooking. All ovens are different of course just make sure you know your oven. OMG thank you so much Johlene!!!! I appreciate the warm compliments! Amazing…would love if you invite me for dinner any time 🙂 great photos so mouth watering…I love how rich of ingredients this is…thanks for sharing.. Thank you Manal for the wonderfully warm comments!!! I love this recipe because I am not a fan of the breaded chicken and I’m going to try this recipe. Thank you for sharing. Thank you Janette!!! I am a fan however the caloric intake is way too high for me! Plus when the chicken is this tender who needs the breading! Your food photos really make this recipe look tantalizing! I wish I could pluck some off my computer screen with a pair of chopsticks. Awwww thank you so much you are beyond sweet! I love this recipe but right now, I can’t get past the quality of your photos. Amazing. Just….amazing. Sharing! Thank you Nagi!!!! It’s all thanks to your influence! Homemade is always better, isn’t it? Love all the veggies you have here – what a great all-in-one meal! Love sweet and sour! Looks so tasty! Beautiful pictures! I love being inspired by food I eat in restaurants! I love that you combined all these wonderful veggies too with a jarred sauce (well, why not?). And … that ginger broccoli … oh my! Got to try that! Love love love your photos, too …. just gorgeous! Thank you honey!!! Thank you so much!!! I have been working hard on my photos!!! So good to hear it’s paying off! OMG, how did I miss this?! Mila, this dish looks phenomenal! Seriously, I want to do a face-plant into the screen! Sweet and sour chicken is one of my favs, but he breading is not kind to the waistline, so I really appreciate this lightened-up version. Lightened up but amp up the flavor… what’s not to love!? Not to mention, I think these are your best photos yet! Simply stunning! I have never heard of a sprinkle before. It sounds so cute! Your photos are incredible and the chicken dish is simply amazing! Pinning. I too am a big fan of sweet and sour chicken..so this is right up my alley! Gorgeous photography, Mila!! Wish I had a big bowl sittin’ in front of me right now! This stir fry looks absolutely delicious! LOVE how saucy it is!